An interesting survey (Universum), if you like that kind of stuff, and if that’s not just an oxymoron anyway, tells us that undergraduate students most want to work for Google (1st) and Disney (2nd) out of a whole host of employers. Does this speak to the infantilization that is sweeping through our current culture, where achieving child-like dependency seems de-rigeur, or is it just a natural reaction to the over-loading we receive as consumers, where we never really choose, but are constantly fed things (child-like dependency image here being of parent with spoon and baby with open mouth) such as fashion, tech, lifestyles(? ), and anything else you’d like to insert? 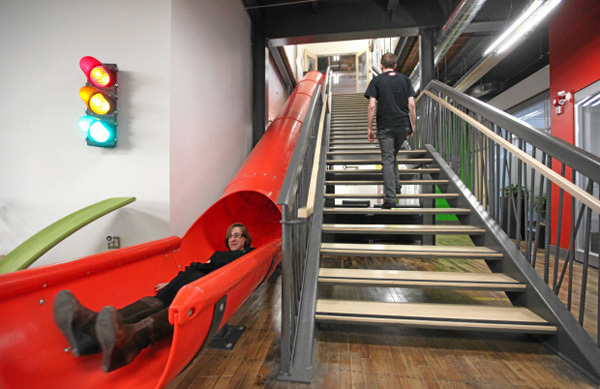 Google’s work spaces/places are modelled like playgrounds for big people, where you can indulge yourself in playful activities, whilst being creative at the same time, allegedly. Disney’s work spaces/places, well, you probably don’t need me to picture that for you. What is it with attempting to tap into the ‘inner-child’ of adults, when the reverse seems to be the case when it comes to children, children who are bombarded more and more with images, rhetoric and the like designed to increase maturation and speed up the process of becoming an ‘individual’ who consumes? It creates an interesting paradox, if you care to think about it. Grow up fast, get a job with Google and/or Disney, then spend your adult life trying to regress. The data from the 2015 Universum Student Survey was collected between September 2014 and January 2015. The following results are based on the responses of more than 81,000 undergraduate students. The ranking represent the employers most selected as Ideal by student respondents. This entry was posted on Tuesday, March 31st, 2015 at 8:43 pm	and tagged with Disney, Google, infantilization, Universum and posted in Pondering, Popular Culture. You can follow any responses to this entry through the RSS 2.0 feed. Narcissists are like children. Not saying that they are, but it’s kind of how they are wired. They also don’t like to change their clothes and eat all their food coated in chocolate. Having constant affirmation that this is a great way to grow is costing us a lot more than just some tracking cookies.